Product #46703 | SKU 18930 | 0.0 (no ratings yet) Thanks for your rating! 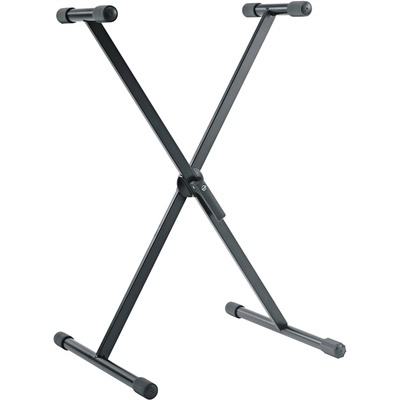 The 18930 X Keyboard Stand from K&M is a height adjustable stand designed for easy transport and storage. It can be used to support standard digital pianos, synths for live stage, home, rehearsals, and more. The stand features K&M's ergonomic clamping mechanism that makes setup or break down easy and fast. It can be adjusted in a multitude of positions in 5° intervals. Back rubber end caps can be adjusted so you can match the width of your keyboard and stabilise the stand on uneven surfaces. The maximum support depth is 13.8".